The story of the legendary Phantom started over four hundred years ago. The adventure began aboard a sailing ship on the high seas. The vessel was attacked by pirates and only one man escaped. He swan for his life, and when it he could endure no more, a powerful current carried him to rest on a remote beach. He had survived and now devoted his life to make this land which fate had led him to, into a place of peace and justice, a fit place for men to live. Generations have passed. And now the sixteenth Phantom continues the work of his ancestors. Over the generations the natives have seen no change him in, so they believe him to be immortal. They call him, The Ghost Who Walks. And there is the Legend...anyone who sees the Phantom unmasked dies at once - a horrible death. He lives in the Deep Woods at Skull Cave. Details of all the adventures of the previous Phantoms are buried in the Phantom Chronicles, which only the present Phantom can access. Educated in the United States, he returns to great wealth in treasure buried deep in Skull Cave. Fighting all kinds of evil and treachery, the Phantom rides his faithful horse, Hero and always at his side is Devil his dog. I first started reading adventures of The Phantom in TV Tornado in 1967. The stories was great and the art-work of the best quality. 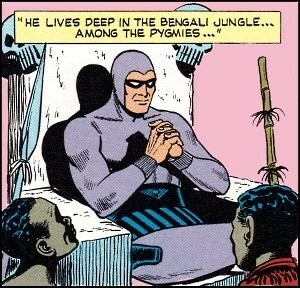 Phantom Annuals was produced in the 1960's which again was great quality. An intriguing Super-Hero.